I have completed my dose of roaccutane mid October 2012, when can I start dermarolling. I am thinking of ordering the whole kit. I have deep, pitted, ice pick, boxcar acne scars. I was also on accutane and went through fraxel laser treatment. When my doctor was going through the options for me she stated that she would not be able to do any kind of procedure until 6 MONTHS after I stopped accutane. So you would have to wait until the end of march. The reason is that the skin may not heal properly after an accutane treatment. On other forums the doctor stated that there is no official literature regarding dermarolling after accutane, she would put a yellow caution flag regarding this subject. Since you are so close to the 6 months mark I would wait or AT LEAST do a test patch. Good luck to you and keep me posted on your journey. Do you have acne scars? 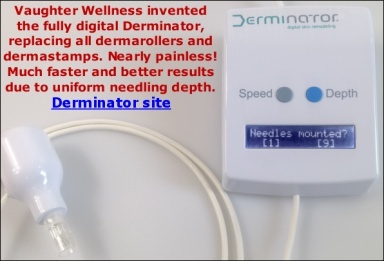 I just signed up to this forum and have received a dermastamp.